Good numbers and a fairly decent variety (c 35 spp.) of moths were caught last night (21/8) but nothing out of the ordinary - rather boring, really! Two migrants - singles of silver y and dark sword-grass ( I also saw a rush veneer in a different W Llanelli garden yesterday). Above: black arches, one of my `regulars`. Excellent photo, Ian - new camera? I was inundated with moths last night too, ideal conditions here - warm, moist , no wind. I haven't finished the 'documentation' yet so will have to blog tomorrow. Like you Ian, nothing unusual, which was a bit disappointing considering the numbers! Thanks Steve - yes the `new` camera. Chris - it was quite disappointing - plenty of moths and an abundance of flying ants and small beetles, but little of special interest. I`ve just (at c 10.00pm) noticed the S/SE wind, so I`ve shoved an MV onto the flat roof - `just in case`. I really should have trapped at my SN50 bog/woodland target site tonight, but `out of stride` after the recent `moth lull`. 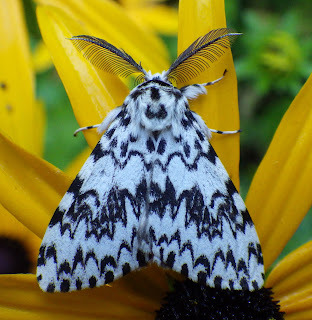 Will blog tomorrow if I get anything of interest...I could `do` with a death`s-head hawk moth or something good!